We invite you to join us for another installment of our Tech Talks at 7pm on November 25th 2014 in the downstairs of The Monarch Tavern. We are delighted to once again host SIGGRAPH Dailies. Mark Elendt, Dailies Program Chair for SIGGRAPH 2013 and 2014, will once again join us and present a celebration of excellence in computer graphics. Dailies lets you experience the vibrant production culture behind the finished art. It is a series of very short presentations by artists who tell the story behind the imagery they created. With less than two minutes for each presentation, you’ll want to make sure you arrive early for this fun and exiting portion of SIGGRAPH! flatfab, developed as part of James’ Ph.D. work, is a software package that helps you design and fabricate 3D objects. We imagine in 3D but ideate and draw in 2D. flatfab seamlessly does both! Having also delved into immersive technologies, James brings us Janus VR: a web browsing platform for converting any HTML page into an immersive experience. Designed for the Oculus Rift, Janus VR can also show enhanced 3D content with specially-crafted HTML code. We dare you to step through this navigation portal!! Additionally, we will be having our Chapter elections concurrently with this event. We invite you to come out and vote! Our Volunteer Board of Directors is led by your four chapter officers Chair, Vice-Chair, Secretary, and Treasurer with 10 Members-At-Large. These honorary and elected positions are held for 2 years. Please come and cast your ballot, in person, with a piece of ID. Elections are being hosting for the Vice-President, Treasurer, and a Member-at-Large positions for 2015 – 2017. Find out more about our Chapter candidates. $5 for members (use membership number as your discount code). Note yet a member? Purchase your membership and join this event for free! 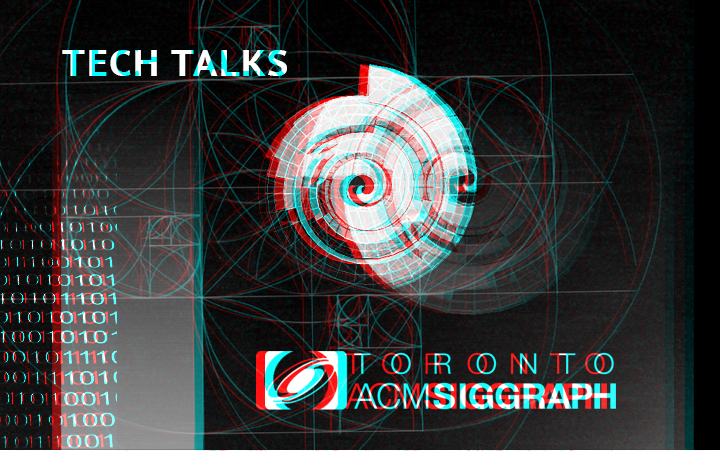 Join us for an exciting evening of computer graphics, immersive technology, good cheer, and a whole lot of fun with your Toronto ACM SIGGRAPH Chapter!